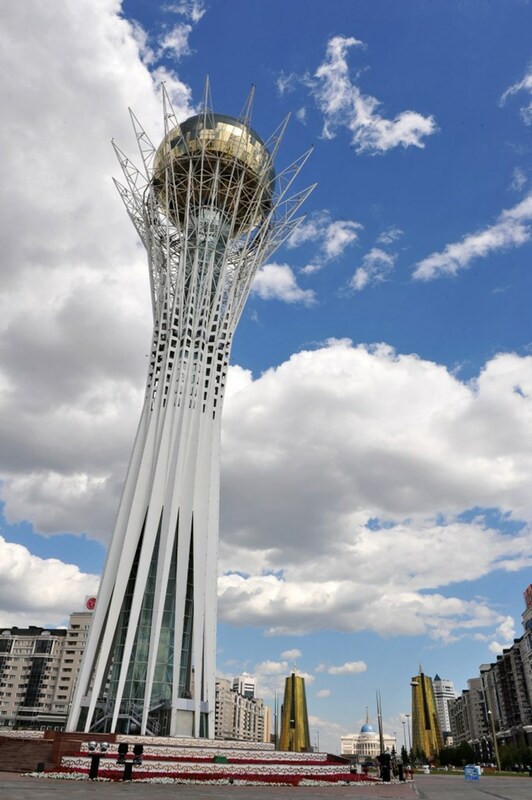 This spectacular monument is not the KTM spherical tokamak but the ''Bayterek'' (Tall Poplar Tree) monument in Astana, Kazakhstan's official capital since 1997. Please welcome KTM, the most recent addition to the worldwide tokamak family. KTM, the Kazakhstan Tokamak for Material testing, first saw the light of day—that is, experienced its trial start-up—in the city of Kurchatov, in Eastern Kazakhstan, on 5 September 2010. 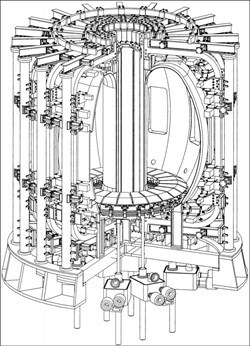 KTM is a rather small, spherical machine with a vacuum vessel volume of 12.3 cubic metres (compared to ITER's 840 cubic metres). Magnetic fields are provided by a central solenoid and an array of 20 toroidal field coils and 18 poloidal field coils. Poloidal and toroidal field coils are copper; the central solenoid is wound with copper and silver alloy conductors. The divertor consists of mounted plates on a rotary table. Plates can be replaced without venting the vacuum vessel by way of the rotating and vertical movements of the table. This capability, along with other assembly-disassembly systems, is essential for a machine which is intended to test plasma-facing materials under powerful particle and heat flux. It enables operators to install components and take them out in a relatively short time. KTM is a rather small, spherical machine with a vacuum vessel volume of 12.3 cubic metres. It was designed in 2000 for modelling plasma-material interaction under conditions expected for ITER. Valery Chuyanov, ITER Deputy Director-General for Fusion Science and Technology describes the Russian-developed concept of KTM as "conservative." "In order to study materials, you need a test-bed with constant characteristics—hence the rather conservative concept." 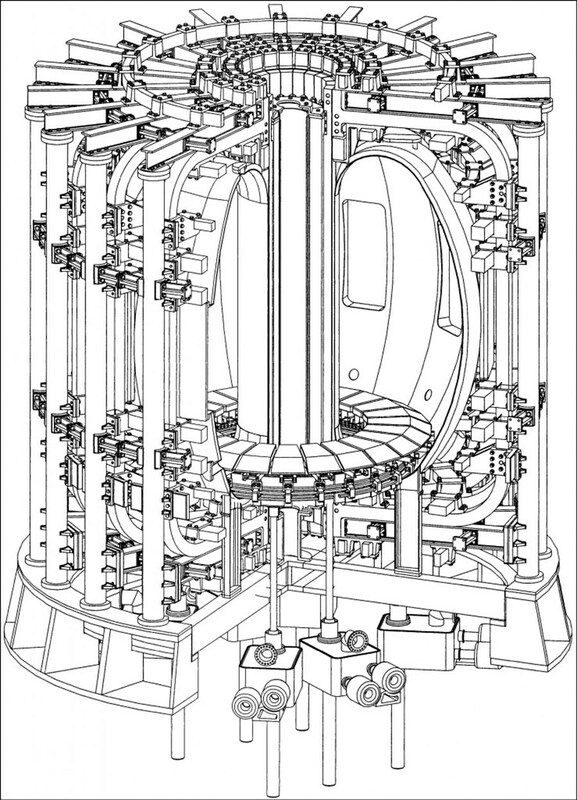 In a September 2000 journal article, Evgeny Velikhov and other Russian and Kazakh scientists presented the KTM project as being "designed for modelling plasma-material interaction [...] under conditions expected for ITER." 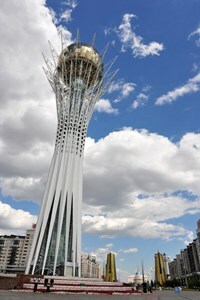 Last May, an article in the European Commission/Research website stressed the importance of the "concrete and growing cooperation [in fusion research] between the European Union and Kazakhstan." The Central Asian nation, which was involved in the earlier phases of the ITER activities (EDA) and at one point had considered becoming an ITER Member, "is among the only three non-ITER Parties with which Euratom has concluded a specific fusion research cooperation agreement." With a discharge duration of 40 ms and maximum current of 25 kA, KTM's first plasma on 5 September was consistent with calculation scenarios.